Definition at line 26 of file MCSectionCOFF.h. Definition at line 92 of file MCSectionCOFF.h. Definition at line 70 of file MCSectionCOFF.h. Referenced by getAlignment(), llvm::MCContext::getAssociativeCOFFSection(), isVirtualSection(), and PrintSwitchToSection(). Definition at line 71 of file MCSectionCOFF.h. Referenced by getAlignment(), and isAssociative(). Definition at line 82 of file MCSectionCOFF.h. Definition at line 69 of file MCSectionCOFF.h. 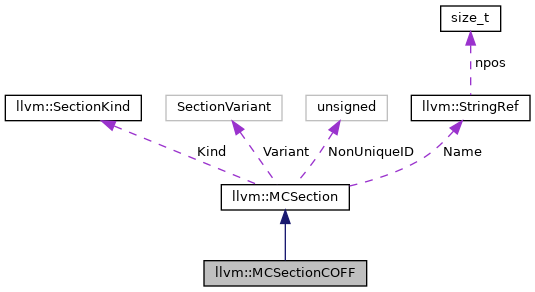 Referenced by getAlignment(), llvm::MCContext::getAssociativeCOFFSection(), isAssociative(), and PrintSwitchToSection(). Definition at line 72 of file MCSectionCOFF.h. References isVirtualSection(), PrintSwitchToSection(), Selection, setSelection(), and UseCodeAlign(). Definition at line 88 of file MCSectionCOFF.h. Definition at line 111 of file MCSectionCOFF.cpp. Definition at line 37 of file MCSectionCOFF.cpp. References assert(), getCharacteristics(), getSectionName(), llvm::COFF::IMAGE_COMDAT_SELECT_ANY, llvm::COFF::IMAGE_COMDAT_SELECT_ASSOCIATIVE, llvm::COFF::IMAGE_COMDAT_SELECT_EXACT_MATCH, llvm::COFF::IMAGE_COMDAT_SELECT_LARGEST, llvm::COFF::IMAGE_COMDAT_SELECT_NEWEST, llvm::COFF::IMAGE_COMDAT_SELECT_NODUPLICATES, llvm::COFF::IMAGE_COMDAT_SELECT_SAME_SIZE, llvm::COFF::IMAGE_SCN_CNT_INITIALIZED_DATA, llvm::COFF::IMAGE_SCN_CNT_UNINITIALIZED_DATA, llvm::COFF::IMAGE_SCN_LNK_COMDAT, llvm::COFF::IMAGE_SCN_LNK_REMOVE, llvm::COFF::IMAGE_SCN_MEM_DISCARDABLE, llvm::COFF::IMAGE_SCN_MEM_EXECUTE, llvm::COFF::IMAGE_SCN_MEM_READ, llvm::COFF::IMAGE_SCN_MEM_SHARED, llvm::COFF::IMAGE_SCN_MEM_WRITE, isImplicitlyDiscardable(), llvm::MCSymbol::print(), and ShouldOmitSectionDirective(). Definition at line 31 of file MCSectionCOFF.cpp. Definition at line 19 of file MCSectionCOFF.cpp. Definition at line 107 of file MCSectionCOFF.cpp. Definition at line 53 of file MCSectionCOFF.h.